I want to precise I don’t search to convince somebody. Each one will found in this article what he wants to find, some advices, informations or a point of view but under no circumstances a desire of convert anyone to buy Leica equipment. As it says, the best equipment is the one we are using. It’s evident that the historic side almost mythic of the German mark bring a lot of people to ask themself on the well-founded of the price charged by Leica. Are they justified ? The Leica’s equipment is it so great ? Many questions I asked myself and those for which I would have liked explanations other than those of salers, « aficionados » or detractors of the mark at the red dot. Fan of the street photos, posed photos and great apertures, it seemed to me that the M system of Leica was, at least, in phase with my aspirations. The positives points are, obviously, the compatibility and the raisonable weight of both, camera and lens. It’s clear that the fact of not to hang 7 or 8 kg of material in a big packbag was very determinant in the choice of Leica. Benefit a bigger mobility by conserving a true performant system gave to me a way to increase significantly the sceance shooting, by leaving the big and heavy Reflex and all his lens in a warm place at home. Other important factor, the discretion of the legendary M camera and his optics of reduced size. A true advantage to do photos with the biggest discretion. The first thing to take in consideration, before everything else, is the fact that the Leica M System is, essentialy, based on the principe of the rangefinder and the manual focus. You must therefore accept from the outset the absence of autofocus and all the aid associated. For some of you, It seems that the principe of system referred is what makes it repulsive, whether by the immediat rejection of the absence of autofocus or by the apprehension of the impossibility to succeed pictures with rangefinder. Away from me the idea to judgment on this state of affairs. I advocated to the one who is attract by the Leica concept to do a life-size test with a rangefinder camera for evaluate his own aptitude and efficacity of sight system which is, certainly, truly particular. For me, the first experience ended by a half-failure. My first purchase Leica was the acquisition, four years ago, of a camera M8 Leica and a lens of 35mm f/2,5. If the rangefinder didn’t give me any trouble in particular, I wasn’t immediately hooked to the concept and I sold, few weeks after, the entire material. It seems that the eventuality for me to leave Reflex’s world wasn’t possible at this time. Before going further, I will give some indications on the vocabulary and some other precisions which allowing to apprehend better the article and to familiarise with Leica’s universe. The following camera are film camera. Having never owned personnaly, they won’t make the object of remarks in this article. By order of apparition : Leica M3, MP, M2, M1, MD, MDA, M4, M5, CL, MD2,M4-2, M6, M6J, M6 TTL, M7,MP Only Leica M7 and MP are still product by Leica at this day. Leica M8 : sensor APS-H (18mm*27mm) 10 mpx CCD Kodak, conversion factor of 1.33 relative to 24*36. Leica M8.2 : sensor APS-H (18mm*27mm) 10 mpx CCD Kodak, conversion factor of 1.33 relative to 24*36. Change shutter more discrete. Replacement back screen by a sapphire crystal glass anti-scratch and anti-glare. Leather cladding change. Leica M9 : sensor 24mm*36mm 18mpx CCD kodak. The first full-size M.
Leica M9-P : identical to M9. Replacement back screen by a sapphire crystal glass anti-scratch and anti-glare.Leather cladding change. 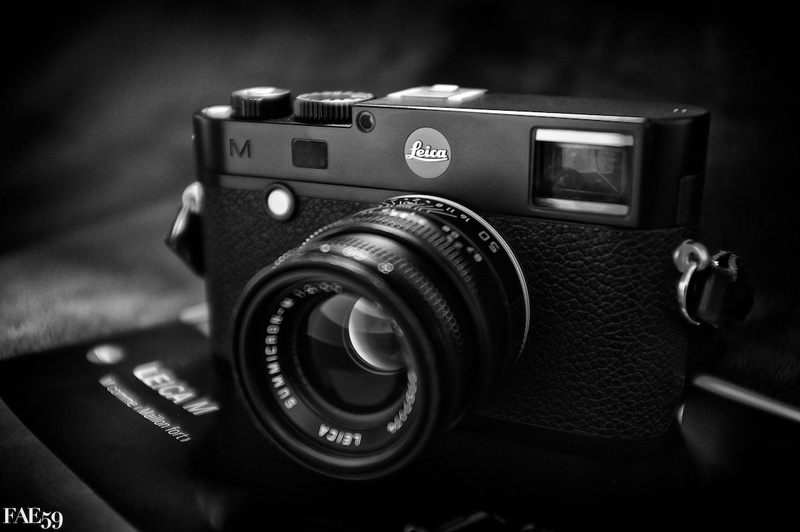 Leica M9 Monochrome : sensor 24mm*36mm 18 mpx CDD kodak designed based on the Leica M9. This camera is unique at this day because it’s the only one which has a sensor dedicated exclusively to the black and white photography. Leica M-E : sensor 24mm*36mm 18mpx Kodak. Identical rigously to the M9, it’s distinghuished only by its anthracite gray. Leica M (Type 240) : sensor 24mm*36mm 24 mpx CMOS. Back screen changed, video mode, Liveview, batterie more powerful… The break with the case of M9 previously used on the all digital M is abandoned. Elmar et super-Elmar : aperture at f/3.4,f/3.8 or f4.0. Existing focal 18mm, 21mm, 24mm, 90mm macro. Tri-Elmar : aperture at f/4. lens at triple focal 16-18-21mm. Summarit : aperture at f/2.5. Existing focal 35mm, 50mm, 75mm, 90mm. Summicron : aperture at f/2.0. Existing focal 28mm, 35mm, 50mm & 50mm APO, 75mm APO, 90 mm APO. Summilux : aperture at f/1.4. Existing focal 21mm, 24mm, 35mm, 50mm. Noctilux : aperture at f/0.95. Existing focal 50mm. APO-Telyt : aperture at f/4.0. Existing focal 135mm. A particularity very significative of the system M Leica is that the bayonet didn’t change since 1954, date of the creation of the M camera, whose shape has not change since. This implies that the oldest lens can be mounted on an recent camera without any problem. The lens of anterior design at 1954, often with screw, can be also put on a camera M digital or film camera recent by means of adapter ring (named LTM) without difficulty. All of this allows at Leica’s user to dispose of an park of lens very extended. 2 or 3 years after to have discarded a first Leica M8 and after to have touched an Olympus and a Fujifilm, my interest for the Leica M System came back. The trigger was a purchase of a Fuji X100 as a complement to my Reflex (Nikon D3s at this moment). This compact camera, expected by many of amateur photographer, with his retro look gave me taste the concept of the photo lightweight device to lens fixed but with an excellent picture. The pleasure was such that the Reflex was abandoned in his bag at home. So, I took the difficult decision to separate me from my reflex system. I said difficult because even if I was persuaded that I no longer need this system, long years of habit do not give up so easily. While maintaining the Fuji X100, I took the option to provide me with by complement of a hybrid system at lens interchangeable to have a range of focal more extensive that a simple 35mm of Fuji. The fact of having in hand (and mainly in the bag) some camera and hybrid lens of good quality (Olympus OM-D EM5, Fujifilm X-Pro 1 …) had truly convince me that Reflex wasn’t indispensable for me anymore. The ultimate qualitative solution of Leica M become almost an evidence.Here is a complete system, how qualitative, compact and strong. And then, why Leica M ? I shall endeavor to be as clear and objective as possible. First of all, and to answer right away to the question that it’s often asked to me, I will say that Leica M system has his limit. If your field of predilection are macro, sport photos or animal photos, you can pass your way. The Reflex system keep an indisputable advantage for those activities. Their focus system ultra perform as well as qualitative and long focal confers to the Reflex a reign without sharing in the field of sports photography or more exactly with disciplines rapid movements. These same « télé-objectifs » and « zooms » excel also for the animal photography. Because if we add to that a mounted iso very effective, we understand easily that to do without a Reflex for this activity isn’t very rational. It’s the same about the macro-photography for who the Reflex system are very complete and guaranty excellent results. Attention, I don’t say that these three fields are totally closed for Leica users. Simply, Reflex is clearly more efficient by is rapidity, materials and accessories proposed. Clearly, if we want to continu to practice these activities, it should considered Leica M system as a complement and not a replacement of Reflex system. In my case, not practicing any of these three discipline, the Reflex wasn’t truly indispensable. The choice of Leica, it’s to dispose a set compact of very high quality in full-size (camera and lens). At the time of my purchase of M8 (of transition for evolved faster for the M9), only Leica knew fill these conditions. Some will say, has rightly, that Sony offers a compact camera full-size since. I agree with that but there is one field where Leica keep, to date, a considerable advantage relative to Sony, it’s the lens park at disposition. Both in terms of quantity than quality. The first is the chronic lack of lens proposed by the mark to the height of the two devices. We must turn towards others trademarks, or even on Leica optics to obtain some interesting result. The all in integrant rings conversion with the random result in function of lens and marks. At the inverse of lot of people that I cross on forums, I would not pretend detain any truth on the quality or not about one or an other lens. Simply, I think of pragmatic way that when lens are made by a mark, they are built by embedded technology and known of that mark. The best results, out exceptions, are truly obtained in this way. So I have some difficulty to understand the gait who consist to buy a camera Sony, a ring often from other mark and a objectif from a third one. That doesn’t mean that won’t work. But I am sure that never an optic Leica will be best on a Sony A7 or A7r than on a Leica M.
The second, is the fact of so many different directions technologic taken by Sony since his entry in the world of photography who are not really reassuring for those who search to sustain a photographic system. Quid of the full-size 850 and 900 whose the SAV are no more assured ? Quid of the futur of Nex (to the output of A7 and A7r)? Quid of those compacts upscale very expensive which succeed each too fast ? Quid of the incomprehensible absence of a range of lens qualitative ? That’s looks like a mark who’s still research his own marks in a photographic sector where two Japanese mastodons leaving only crumbs… It’s seems to me that Fuji has perfectly understood to stand out radically by the output of a gamme of hybrid product consistent, announced by a road-map precise and held who announce clearly to his potential clients the perinnity of the system in the futur. Back to Leica… So after a short passage with a M8 and his great 40 Summicron, I made the leap to full size with the arrival of the M9 and a Summicron 50mm f/2.0 used. For me, the choice of Leica it’s first of all for the optics. The Leica lens are great, and this right the full aperture. For me who came from the Reflex universe, it’s truly new in the meaning where not a lot of reflex optics gives the best to the very large aperture. This is explain visibly by a reduce optical printing by Leica. I won’t enter to the technical details, I don’t have the knowledge and it’s not the lens of this article. What is clear, that is the Leica lens are excellent. You will say to me, at this price, that’s, at least, what we can expect. Certainly but it must put the announced price in front of the product who is sold. The Leica lens are very compact, these more compact, and of very far, on the market of the full size. They are made in glass and true metal and not in composite glass et various alloys lower end. That doesn’t stop the Leica lens to appears strength inside the top lens during the different tests realized. More, the market value stay very stable in the time. A Leica lens bought used at a good price by example will be resold several years later at the same price or more in view of the annual increase. The summicron 50mm that I bought with the M9, I bought it 900 euros (app. 1250$). This lens is from 1995 and is in perfect good shape despite a regular use. It is evident than I could resell it almost the same price. The Absence of internal engine and any form of electronic (stabilisation) allows a longevity without equivalence. I just buy a Summicron 50mm said « Rigid » in perfect shape that date 1960. Ok but the photo in all of this you will tell me ? Well I think i will take back a famous sentence who said « the price is forgotten, the quality remains ». That exactly the feeling prevailing to the use of Leica’s set. The pleasure felt with a Leica camera and an Leica optic is difficult to translate as it is intense for the one who like it. In my case, I have the deep sense to make one with the set camera/optic. Whatever lens and focal used, a magical Osmosis occurs with the camera. this is the true paradox with all of that, it comes to not think of the material to focus only on the shooting. We enter literally inside the picture, the moves become naturel and the absence of zoom for fans (like i was) is not a problem anymore. At the point that we don’t think anymore to the photo only by a fix focal. My lens of predilection at this day is the Summicron 50mm f/1.4 who is an incredible lens. Beyond excellent sharpness, it’s a lens of subtility by some transitions magical net / blur, with a bokeh outstretched esthetically magnificent and a shaped with a finess exceptionnal. In reality, it isn’t perhaps the perfect lens but the word who comes to my mind is artistic, this lens is truly artistic…. To date, I own five Leica optics. The focals are the following, from left to right : Elmarit 24mm f/2.8 Aspherical, Summicron 35mm f/2.0 version IV (surnamed king of bokeh), Summicron 50mm f/2.0 dit Rigid, Summilux 50mm f/1.4, Summarit 90mm f/2.5. The common point of these lens is a pretty sweet rendering, without the aggressivity rather marked of recent Aspherical lens. It appears that my taste is more to that relative sweetness because some test of numerous lens, brought me to some optics oldest irreparably. That’s also a true opportunity in Leica, namely to have the ability to acquire some lens with a rendering who can be very differents in fonction of the focal, of the generation and of the model chosen. the two 50mm that I own are for example very differents by their rendering. I spoke about the 50 Summilux, the 50 Summicron Rigid is even sweeter with a bokeh turning very different but very pleasant also. So, You will note that the lens range is very large and the possibilities are multiple, for the biggest happiness of the users of the mark. The second-hand market, very attractive, is a perfect way to have lot of lens in function of its tastes for a cost control. I spoke lengthily on the choice between the Leica M (type 240) and the M Monochrome. It should however to consider that it’s possible to do very good black and white photos with a M240. The pictures will need to be a little more worked to arrived to a result very near of the one of the Monochrome. This last one is one level on top for the black and white photos without any doubt, It offers a superior subtility with a rise in isos impressive. The respective prices of the cameras are 6200 euros (app. 8500$) for the M240 and 6800 euros (app. 9300$) for the Leica M Monochrome. My dream for times to come : the sensor of the M Monochrome in a M240. The M8 or M8.2… These two camera are excellent. The sensor CCD Kodak is very good and it is possible to do very good photos with that camera. It allows, besides, a bigger tolerance for blurs to move by his inferior resolution and his sensor smaller. So the long focals are to privilege for these camera. A 35mm become the equivalent of a 47mm, a 21 become a 28mm… This can be an advantage in certain case but for many, the M8 is synonymous of hybrid focal and those who had awaited the M full size before to switch to digital, namely the M9. In black and white, it will be possible to go up to 1600 iso. In color, according to the conditions, 800 iso appears to me to be the maximum for a qualitatif result. In used, the M8.2 will be to privilege for me. His conception more recent give him a better resistance electronic and the risk of breakdown will be inferior probably to the M8. The second-hand price (depending on price, the warranty or not, the accessories…) will be sensibly in average of 1100 euros (app. 1500$) for a M8 and 1500 euros (app. 2000$) for a M8.2. Be careful, it should take in consideration than the M8 and the M8.2 are irreparable by Leica to the sensor level and the screen by lack of spare part. The M9, M9-P, M-E… Sensor full size, screen of another time (insupportable), robustness recognized, the M9 was the first digital camera full size of Leica. It reconciled the film camera’s users of the mark by getting back the focal 24*36. The 50mm is became again a 50mm, the big angles took back their open field as before….Usable in color until 1250 isos, the 2500 isos will be reach without problem in black and white. Like for the M8.2, the M9-P will be preferred by his conception more recent with a screen Saphir (but best but more solid) and a appearence more discreet ( no more writing on the front of the camera). The second-hand price are respectively 2500 euros (app. 3500$) for the M9 and 3000 euros (app. 4000$) for the M9-P. These price announced are to relativise of course in function of the offer to the seller. The M-E will be put aside in the meaning of it is still sold. So what to do, which camera to choose ? If your budget allows it, the M240 or the M Monochrome must be really considered because these are exceptional cameras who will allow you to pull the quintessence of Leica’s lens, no matters the options chosen, recents or more traditional. To start slowly, the solution of the M8 or M8.2 is to think about, even if it exist a potential and real risk of breakdown irreparable. Even so, it is a very good camera not to expensive in second-hand who can allow to taste to the method Leica without ruin. It’s a camera who will be easy to resell at the same price you bought it (if the purchasing price is conformed to the market). For a intermediate budget, the M9 is an excellent choice. Full size, efficient, solid and well tried, It gives some excellent results. Even If it suffer from some defaults (back screen, battery a little to small…), it will make his owner happy by his high pictures quality and his facility of implementation. After more than one year of practice of the Leica’s material, did I regret my choice and my important investment allowed to acquire a camera and optics wanted ? Evidently no, the pleasure procured by this material is at the level I hoped. The wish of start was to have a system the more compact as possible but also a quality of pictures without concession. The bet is kept and the photos that i make today providing me a true satisfaction. If I should give a advice to anyone who wish to try the Leica’s adventure, it will be to find the set camera/ lens in his budget by balancing expenses for privileging his choice of optics. Do not forget that the lens will stay when the camera will be resold. That doesn’t mean that the choice of the camera is not to take in consideration seriously at the moment of the purchase, but it doesn’t take precedence necessarily. Each must choose his focal of predilection according to his practice and the Leica’s offer is enough expanded in the new and the second-hand for equip yourself with the material wished. On my side, when I take back in hand the Reflex’s set, I must say than the weight and the volume impressed me. I’m asking really how I could do two days of photos in London with a pair of D3s and zoom 24-70 f/2.8 who seems to me today gruesomely big and heavy. Evidently, I don’t speak of the quality of pictures because on this level, any problem. Simply, It means to me, it is inconceivable to take back this kind of materials when the offer allows to do less and best today with much more compactness. And this, not only with the Leica’s offer. I will right away clutch your rss as I can not in finding your e-mail subscription hyperlink or e-newsletter service. Do you’ve any? Kindly permit me understand so that I may subscribe. Thanks. You know you could achieve all this with a micro four thirds system for a fraction of the cost and just as much of enjoyment. In my humble opinion, Leica M system is years behind technologically and is one of those products rich snubs buy to show off and then write articles to justify their decisions. Leica M system is out of reach for a vast majority of the worlds population. I think you’ve never had Leica equipment to talk like that. Me, I had the Micro Four Thirds equipment, no comparison between the two systems, Leica is much better . Will test the Leica’s lens and you will understand what I am saying. It is a shame to be so restrictive speaking of Leica because there are not only rich and snob people who have this type of equipment. I have both system and each has its place. I have a M8.2, M9, and film Leicas. In addition I have the new 4/3 Olympus EM1, a wonderful camera for snaps and very well made. It doesn’t compare to a Leica with Leica glass. The files in LTR 5 will show the difference. Leica is a wonderful made camera with you controlling the camera and can surpass any other camera except in the area of sports or macro photography were reflex cameras are the norm. /Thanks for the write up. I use a Leica « M » for a few months mounted with a Summicron 50mm, a wonderful camera that teaches me photography again after 30 years of shooting. I worked with Leica M7 in the anolog period. I sold my Canon 5dMk3 and all of my lensses, had to save up for months, work extra to be able to get my dream camera, so not all Leica users are rich! I love photography, I love to work manualy and I love rangefinder technology… it is so pure to work with that equipement. If you have never used a rangefinder… Leica, Contax, Canon… you have no idea! Great article! Why are there so many Leica haters? I simply do not understand this ! Nobody can deny they make some of the most wonderful optics in the world.An example of this is the new M 50mm Apo lens -check this out ! They make medical and scientific optics used in the most advanced labs in the world. They also make binoculars and telescopes used by wildlike experts the world over. The M Leica is a digital reincarnation of the old Leica film cameras and the new M has many advanced features and and yet keeps some of the old features which have proven value expressed by so many famous photographers. They make a modern advanced pro level camera the S which is highly regarded by pro photographers. They are made in Europe by well paid workers not in some Asian sweatshops.. Yes they are expensive -I have an M8 and some lenses and no I certainly am not rich and neither are the other people I know who use Leica cameras. I have tried other cameras and like my M leica best … I have no disrespect for wonderful cameras like the Canon 5d or the Nikon D4 or the Sony a7 all wonderful cameras -nice to own them all- but we must choose and so now it’s time for us all to make some images ! Most people who denigrate the Leica are often frustrated at not being able to afford one. So they prefer to criticize systematically referring to the price. Leica lenses are the most performant lens on the market, it is undeniable and it is only the fundamentalist opponents for not admitting it. I have the 50mm Summicron Apo is the best 50mm I’ve seen until now. Leica equipment is expensive, it’s true. But I’ll keep it for many years without change continuously as when I owned property Canon or Nikon, always looking for the slightest change. And then I made ​​choices, a cheaper car, less frequent holiday… but the pleasure to make photographs with a material that gives me a lot of satisfaction. Very useful article. I have been waiting many years to get my first Leica. I started with the M6 and now saving for the M-P. Being able to buy old 2nd hand lenses is a big advantage. Exactly, it’s an error for the arpeture of Summilux. The correction is ok.
Vielen Dank für diesen doch auch sehr emotionalen Monolog zur Leica. Auch ich habe seit meiner Kindheit mit Minolta, Hasselblad, Nikon und Canon fotografiert, aber das Fotografieren mit Leica ist « beseeltes » Fotografieren. Die Art der Schärfe und Unschärfe in verschiedensten Relationen, das ist Malen mit Licht. Ich werde mir irgendwann das Apo-Summicron 50mm kaufen: ein Quantensprung. Hello Professionals! I love the quality of leica camera. Five years ago, i picked one up and cannot put it down. I will be shooting high diving soon. which is a good model to go for? The M240 is a fantastic camera, very successful and it can make stunning images. An excellent choice to start. On occasion, this is a great opportunity.